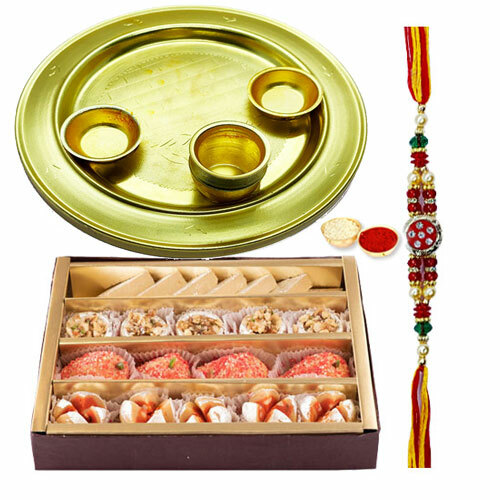 Nicely Gift Wrapped Silver Plated Rakhi Thali (Thali Size 5 to 6 inch) with 100 Gms. (Gross Wight) Assorted Sweets from Haldiram and 1 Free Rakhi, Roli Tilak and Chawal. Send this Rakhi Gift Anywhere in India. This special Rakhi Gift will make your loved ones feel happy. Silver Plated Rakhi Thali (Thali Size 5 to 6 inch) with 100 Gms. (Gross Wight) Assorted Sweets from Haldiram and 1 Free Rakhi, Roli Tilak and Chawal. Silver Plated Rakhi Thali (Thali Size 5 to 6 inch) with 100 Gms. (Gross Wight) Assorted Sweets from Haldiram and 2 Rakhi, Roli Tilak and Chawal. Silver Plated Rakhi Thali (Thali Size 5 to 6 inch) with 250 Gms. (Gross Wight) Assorted Sweets from Haldiram and 1 Free Rakhi, Roli Tilak and Chawal. Silver Plated Rakhi Thali (Thali Size 5 to 6 inch) with 100 Gms. (Gross Wight) Assorted Sweets from Haldiram and 4 Rakhi, Roli Tilak and Chawal. Silver Plated Rakhi Thali (Thali Size 5 to 6 inch) with 250 Gms. (Gross Wight) Assorted Sweets from Haldiram and 2 Rakhi, Roli Tilak and Chawal. Silver Plated Rakhi Thali (Thali Size 5 to 6 inch) with 250 Gms. (Gross Wight) Assorted Sweets from Haldiram and 4 Rakhi, Roli Tilak and Chawal. Silver Plated Rakhi Thali (Thali Size 5 to 6 inch) with 500 Gms. (Gross Wight) Assorted Sweets from Haldiram and 1 Free Rakhi, Roli Tilak and Chawal. Silver Plated Rakhi Thali (Thali Size 5 to 6 inch) with 500 Gms. (Gross Wight) Assorted Sweets from Haldiram and 2 Rakhi, Roli Tilak and Chawal. Silver Plated Rakhi Thali (Thali Size 5 to 6 inch) with 500 Gms. (Gross Wight) Assorted Sweets from Haldiram and 4 Rakhi, Roli Tilak and Chawal.